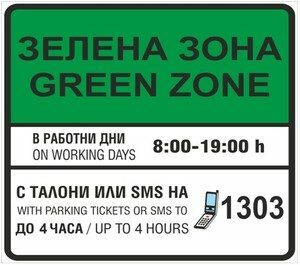 Parking in Sofia, Bulgaria - parking spots, city center, airport, blue zone parking, green zone parking, parking tickets and sms payment, parking price per hour. Parking in Sofia, the capital of Bulgaria, could be really a hard task as it is in all major European capitals. On first place the cars and trucks on the road in Sofia are more than 500 000 according to the official statistic. Second, the streets in the center and in the neighborhoods haven’t been built in the way to have the capacity to accommodate so many vehicles. As a consequence, there isn’t enough space for everybody. For this reason the city council of Sofia has decided to implement 2 different paid zones in the center and around it. The one is called “The blue zone” and it is the hearth of the city center. The other is called “the green zone” and it is around the hearth of the city center in Sofia. There are two ways to pay for the parking in the blue and the green zones. 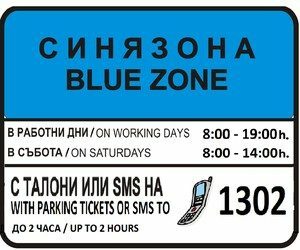 1) To send an SMS to number 1302 (for the Blue Zone) and to number 1303 (for the green zone) but you have to have a mobile number from a Bulgarian mobile operator. You have to send the SMS before you have got off your vehicle. After your payment has been processed you will receive an SMS confirmation and than you can exit your vehicle. – If your vehicle’s plate shows the following number SI2905DH and you have parked in the green zone, than you have to send an SMS to number 1303 with the following text: SI2905DH. 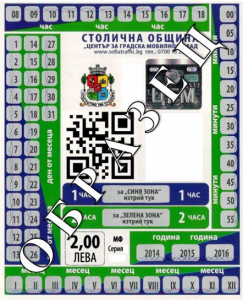 On the following link you can find all paid parkings in Sofia. Pithily it is only in Bulgarian. 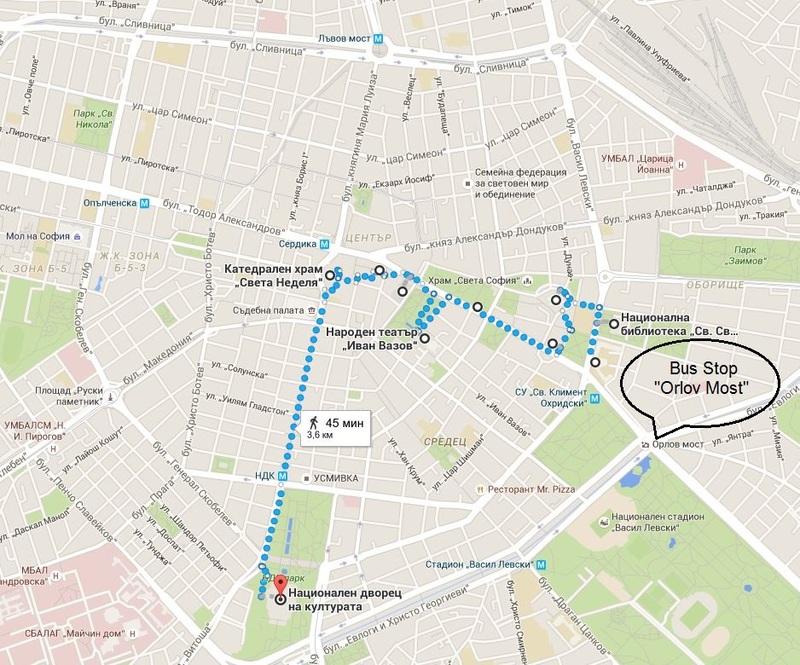 Here you can find a googlemaps map of your walking tour. 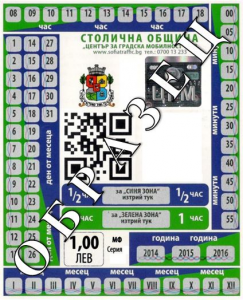 You can learn more about the public transport in Sofia and in Bulgaria on this link. There I will explain everything you have to know about our trains, buses, shared community drives, facebook car pooling and the underground (tube) in Sofia. I will be very glad to help and include every question asked in this website, so that everyone can learn. I am from Finland and visiting my friends in Sofia first time by car. I will be here several weeks and instead of leaving the car some remote hall (good idea on some cases) I would like to ask: is there a possibility to buy longer parking ticket by zone from the “ticket office” to be placed in your window? As a foreign driver I got one free in Timisoara, Romania, because of the system didn’t accepted foreign operators and different plate numbers. I don’t expect to get one free. Thanks a lot for help to make my stay here even more enjoyable. Hi, Markku! Unfortunatelly, it is not possible. Parking in the city center of Sofia is limited to 2 hours, unless you drive a fully electric vehicle. Fully electric vehicles can park for unlimited time in the green and blue zone of Sofia. Good luck! I’m coming to Sofia by car on Friday 22.06 and I continue my journey by train. So a total of 9 days and 15 hours. I see some parking in the center eg “Parking Garage Boulevard” Knyaginya Maria Luiza “Sofia Center” – 15 days 90LV Is this the current price? Where could I park (leave a car) conveniently and near the train station in this period (9.5 days)? Hi Emir! Thank you for your question. There is no cheap parking in the city center. If the car is very expensive, I think 90BGN is not a big deal. If the car is less expensive, you can park around the Metro Station and continue with the underground. There is a underground station next to the main train station. But I would not recommend you to travel by train in Bulgaria. There is no comfort and the train is really slow. It should cost 3-4 BGN per night. When you park, you can the underground metro from “Nadezhda” to the “Central Train Station”. It takes no more then 10 mins and a ticket costs 1.60 BGN. Hello! 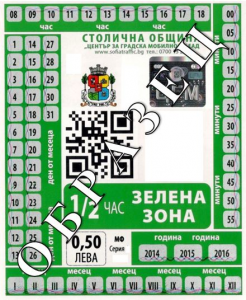 Can you tell me where I can pay a parking fine in Sofia? Thank you! Hello, Oana! Please tell me what happened so that I can give you a correct answer. Hello, so i received a yellow paper on my windshield for parking on the pedestrian area, there were 6 other cars parked there but as far as i saw only mine had the yellow paper on the windshield (mine was the only one with foreign numbers). There were no yellow donuts blocking my tires so i am wondering if this fine can be send to my country (RO) or can i just move the car and not go to the place written on the note. Hi, Claudiu! Would you please send me a photo per email or WhatsApp of the note, which you have received? Thanks! Hi …im planning to cam to sofia at the 29th of November and stay for 4 nights. Is there any parking around НДК парк in reasonable price? Hi, almost every parking around NDK will take you 2leva pro hour. There is one right next to Mr.Pizza. It is a paid one. You can check it out. Hi, Tonya! Yes, Saturday is considered a working day in Sofia. There are some exceptions as well. If for example there is an official holiday on Saturday or if the comming monday is a holiday, then saturday is considered a parking-free day. Green Zone Parking has to be paid 1BGN per hour and the maximum stay is 4 hours. Hello, is the maximum 4h stay on payable hours only or does it apply when parking is free? (e.g Sunday). Thank you. Hi, Alejandro! Sunday is completely free everywhere. 4h stay is the maximum duration in the Green Zone on working days (Monday-Saturday) except public holidays.